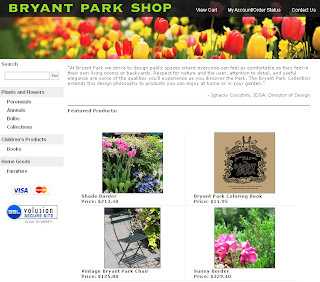 Bring a little bit of Bryant Park into your home or backyard with just a few clicks in our new online shop at shop.bryantpark.org! If you've always admired the park's lush gardens and beautiful planters, browse through our offerings of Annuals, Perennials, and Bulbs, sourced directly from Connecticut's White Flower Farm. From Coleus to Narcissus, each plant and flower in the Bryant Park Shop was selected by our own Director of Horticulture, Maureen Hackett, to reflect the seasonal environments she creates in the park throughout the year. Maureen also handpicked a number of horticulture Collections for the shop, each of which includes complementary plant and flower species that create colorful borders or planters when planted together around your home. Kids can scribble their way through the Bunny & Bear in Bryant Park Coloring Book, our first collaboration with Wee Gallery, and everyone can enjoy the park's signature French Bistro Chairs, in our custom shade, "Bryant Park Green." More items are in development, so keep an eye out for future additions to the Bryant Park Shop! I actually for grow shade perennial for my yard, as I am searching online and landed on your site. I will shop for annuals, perennials, and bulbs. Hope I will find great collections from your site.